André DENIS founded the company in 1956 in Montchal (42 - Loire) near Lyon, sub-contracting being our main business. Since 1965 Jean-Paul DENIS is a part of our family company which then became a limited liability corporation. 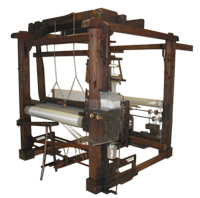 Toward the end of the 80'S, our looms were completely replaced by electronic machines and from sub-contractors we became producers. The company then turned to the production of higher quality ranges, specialising in natural silk. In 1996, Christian and Bruno DENIS became members of the company team. Three years later, we became joint stock-holders of the French company, "Hugo-Soie-Ennoblissement", located in St Just St Rambert in the Loire. From the limited liability corporate form the company evolved to a larger share-holder form. In 2005 a building expansion was made in order to integrate shearing and sublimation print on cloth processes into our production. In 2007, to permit Moulinage de Riotord (specialized in silk yarn) to survive in the textile industry DENIS & Fils became partners of this company.